Staff Correspondent: Bangladesh has the potential to become the main supplier of jute to the global car industry, which uses the natural fibre to manufacture the interiors of vehicles. The global car industry needs about 100,000 tonnes of jute a year, of which 12,000 tonnes come from Bangladesh, according to Mushtaq Hussain, managing director of Golden Fibres Trade Centre, a leading jute exporter. 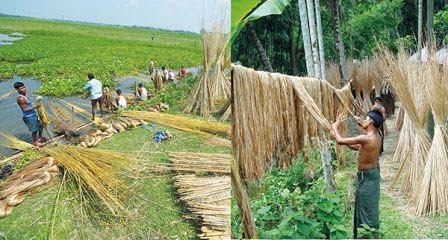 Bangladesh started supplying jute to high-end car brands like BMW, Mercedes-Benz, Volvo and Audi in early 2000s and Hussain is one of the pioneers in breaking this new export ground. Previously, the car industry used glass fibre to manufacture the interiors. But glass fibre is not recyclable or biodegradable, so in 1994 the search for a green alternative began. Jute emerged as the frontrunner. “I was involved in this important research,” said Hussain, who individually sends more than 6,000 tonnes of jute to car brands for $800 a tonne. Interestingly, Bangladesh supplies almost all the required jute fibres used by the high-end car brands, he said. “We could have supplied all the jute required by the car industry,” Hussain said, adding that the Bangladeshi jute is much admired for its high fibre quality. But in reality, the growth in supply has remained stagnant at 5 percent over the last many years. And the government’s unpredictable jute export policy is to blame. “The government stops the export of jute without any prior notice. As a result, the car manufacturers do not fully rely on Bangladeshi jute.” For instance, a few years ago, the government imposed a ban on the export of raw jute from Bangladesh, which left BMW facing a shortage of the natural fibre. The German car brand wrote to the Bangladesh government and after many negotiations the export ban was lifted, according to Hussain. However, small traders cannot supply jute to the car brands directly like Hussain can. Take the case of Kamrul Islam Bulbul, co-owner of Bulbul Traders, a Narayanganj-based jute exporter. He supplies 400 tonnes of jute a year to car brands through other big exporters. He purchases jute mainly from Shariatpur and Faridpur in bulk and processes them in his factory as per the car brands’ requirements. The prices of jute vary with the quality of the fibre, he said, adding that he mainly exports jute to Korea and Japan. Like Bulbul, 10 other small traders supply jute to the car brands like BMW, Mercedes-Benz, Toyota, Renault, Mitsubishi, Volvo, Audi, Daimler Chrysler and Ford. Recently in a keynote presentation at the Dhaka Chamber of Commerce and Industry, Rashedul Karim Munna, managing director of Creation Private, said the use of the natural jute fibre from Bangladesh by global car brands helped in diversification of jute products. As a result, Bangladesh has the potential to export jute and jute goods worth $5 billion to $7 billion annually in the next seven years, he said.